First, we note that the Alpina - a partner of Level 5 Team Motorsports team, this year occupied the third place in the race "24 Hours of Le Mans." Team Level 5 Motorsports, which consists of Luis Diaz, Scott Tucker and Christophe Bushnev, performed on the new car HPD ARX-03b, which was developed in 2012 with the support of Honda Performance Development. Rather, it is in this context, the company presents its new collection of sporty watches Alpina Racing. The new line includes classic sports watches and chronographs. Engineers and designers have tried to Alpina to fully express style and spirit that prevailed on the race track in their new products. How they did it, the readers, experts, and, of course, the prospective buyers will judge. The spirit of the race track designers gave the model Alpina Racing Automatic, provided with the function of a 12-hour chronograph. The basis of the watch - a mechanism Alpina AL-725 on the base caliber ETA Valjoux, decorated with traditional Swiss Cotes de Geneva pattern with a black rotor, whose work can be seen under the transparent case back. 47-mm case, made of steel, is attached to the carbon fiber strap with red stitching. In addition this model also includes a new line of watches Alpina AL-535 based on the caliber Sellita, with a power reserve of 42 hours. 47-mm case of this model is also blurted out of steel or stainless steel with PVD coating. 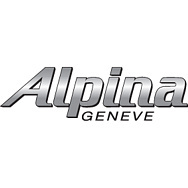 To buy Alpina Racing will be available through the official representatives of the company. Official website of Alpina watches. To attention of all watch lovers the information watch portal montre24.com presents an exclusive video clip of the company Alpina, which took an active part in the annual exhibition BaselWorld 2012.